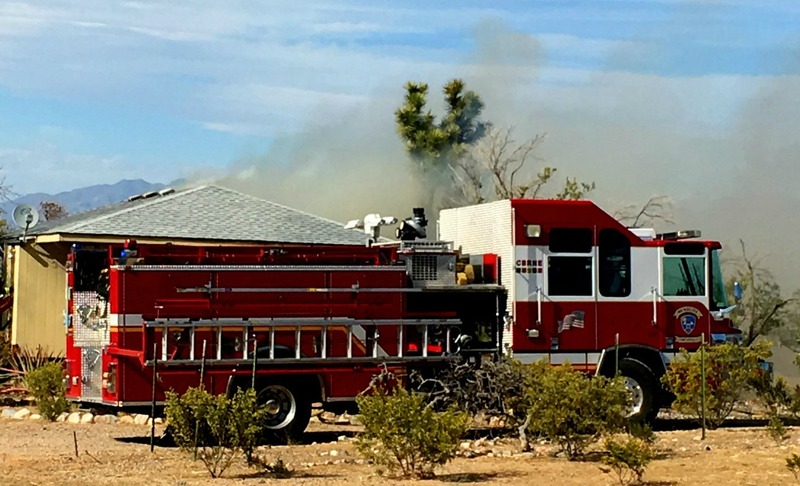 ST. GEORGE — A structure fire in Littlefield, Arizona, spread quickly and destroyed a home Monday evening despite the quick response of firefighters from two fire departments. The suspected – and surprising – culprit of the fire was a basic chemical reaction: spontaneous combustion of peat moss in a planter on the porch of the home. 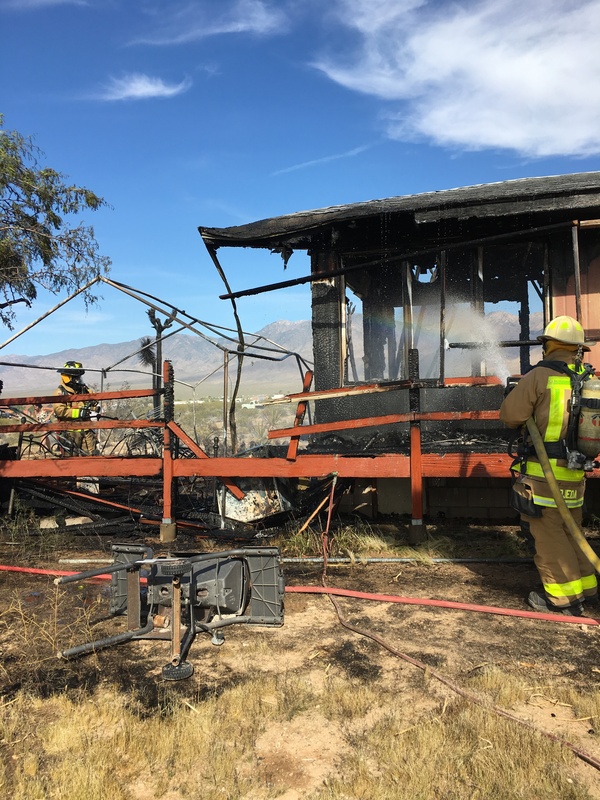 Firefighters and emergency responders were dispatched to a structure fire located on Scenic Boulevard in Littlefield that involved a small single-family residence that was engulfed in flames, Chief Jeff Hunt with Beaver Dam/Littlefield Fire and Rescue, said. Fire engines and trucks responded from both Beaver Dam/Littlefield Fire and Rescue and Mesquite Fire Departments, and within minutes, the trucks pulled up to a scene where flames could be seen coming from the residence. Fire crews began attacking the blaze that was spreading throughout the structure quickly, Hunt said, but with crews from both departments and extra equipment they were able to contain it quickly. The fire was completely extinguished and any remaining embers or hot spots were discovered and doused with water to reduce the threat of the home reigniting later. Within two hours fire crews were released. While investigating the fire, Hunt spoke to the homeowner, who said he noticed smoke emanating from a planting pot that contained peat moss located on the front porch and doused it with water before removing it from the porch. Thinking the threat of fire was eliminated, the resident went back into the house only to find a short while later that the house was on fire, at which point he called 911 for help. “He came out later and found the fire just taking off like crazy,” Hunt said. The homeowner also told Hunt there must have been embers smoldering toward the bottom where the peat moss was originally located. The smoldering material spread to the deck and went unnoticed by the resident when he poured water on the material and removed it from the porch. Once the wood decking ignited, it spread quickly until fire crews arrived and extinguished it. Thanks to an automatic aid agreement between Beaver Dam/Littlefield Fire and Rescue and Mesquite Fire and Rescue, both stations responded simultaneously, arriving minutes apart which enhanced firefighting efforts significantly, Hunt said. Can peat moss spontaneously ignite? According to William Raftery, a fire expert with Fire Engineering, spontaneous ignition/combustion is possible when peat moss or similar organic materials are involved, primarily because they contain bacteria that is then metabolized, which is a process that uses oxygen and produces heat. Generally the process uses all of the available oxygen and poses no threat of spontaneously igniting. However, when fertilizers are present in the soil there is a risk of spontaneous ignition, as fertilizers produce oxygen during the fermenting process, particularly when nitrates are present, Raftery wrote. As the process continues, the heat increases, which also increases the production of oxygen – fire’s two basic elements. If the temperature of the trapped air reaches a certain temperature it can ignite, and the continuous production of oxygen is then used to feed the fire. Hunt said the occurrence isn’t limited to peat moss. Most “chemical reactions” in Littlefield are the result of meth labs. Yo mom, it was the peat moss! Really! linseed oil is one I’ve heard about combusting quite frequently, also moist compost. Peat moss is a new one in my book.